The InnoTech Atira drawer system by Hettich is full of character: Straight lines, clean contours, different colors and a variety of additional elements complemented by versatile interior organisation solutions form the perfect mix for more individuality. InnoTech Atira combines attractive options for differentiating with high cost efficiency by means of a platform concept. The linear design of InnoTech Atira fits into every home and offers a variety of differentiation options for drawers and extensions. Various side elements such as railing, TopSide under the railing or DesignSide, colours, rear panel widths and guides offer individual planning solutions that can be realized flexibly and simply. A simple upgrade from railing to TopSide or DesignSide is also possible. Drilling positions and front panel are not affected by this. The freedom of design has no limits, because with InnoTech Atira, striking design meets proven technology. Perfect differentiation also in function: From the partial extension runner without soft closing to the full extension runner with Silent System or Push to open Silent. Quadro guides satisfy different requirements. 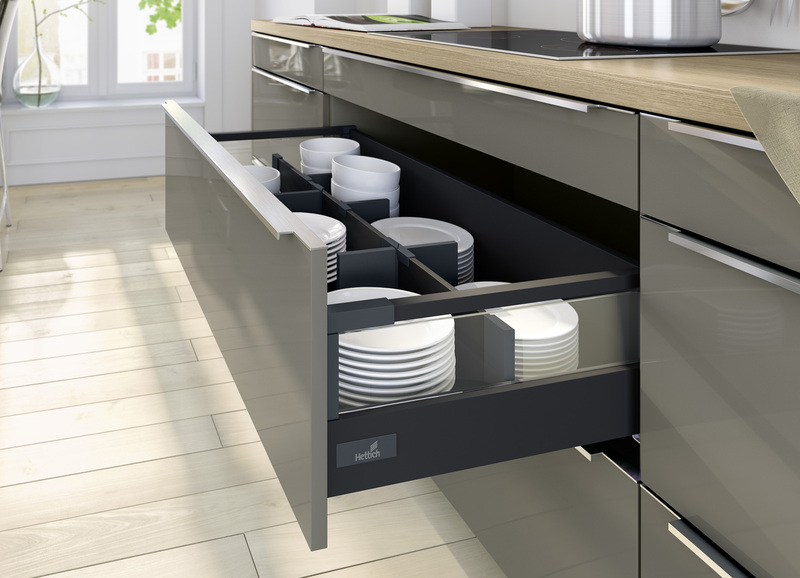 The Quadro partial extension runner is the ideal gateway to double walled drawer systems, and with the option of being upgraded to a full extension runner, the ideal basis for InnoTech Atira. InnoTech Atira also leaves consumers wanting for nothing in terms of interior organisation. The interior organization, perfectly coordinated with the style elements, offers many practical storage details and organization aids. InnoTech Atira belongs to the Hettich InnoTech range. It is a sophisticated range for a variety of applications and is based on an economic platform concept on the basis of one drawer side profile, so that the expenditure in production, warehousing and logistics is kept as low as possible.